The Mauricio Pochettino derby lacked an important ingredient - Mauricio Pochettino. The Argentinian was in the directors' box here, paying off the first instalment of a two-game touchline ban for improper conduct, and he was left feeling helpless and infuriated as his current club were beaten by his old one via a second-half turnaround that appeared to come from nowhere. Tottenham seemed set for victory after Harry Kane scored his 200th career goal on 26 minutes after the visitors, for whom Dele Alli made a return from seven weeks out with a hamstring injury, utterly dominated proceedings. But then came the interval and clearly something was said by the Southampton manager, Ralph Hasenhüttl, in the changing room. His team came out like a team reborn, on the front foot and fearless, and ultimately secured victory thanks to goals from Yan Valery and James Ward-Prowse. The win, Southampton's second in succession here, moves them up to 16th. Tottenham remain third, but after dropping points in the league for a second successive game they will fear they will not remain there for long. 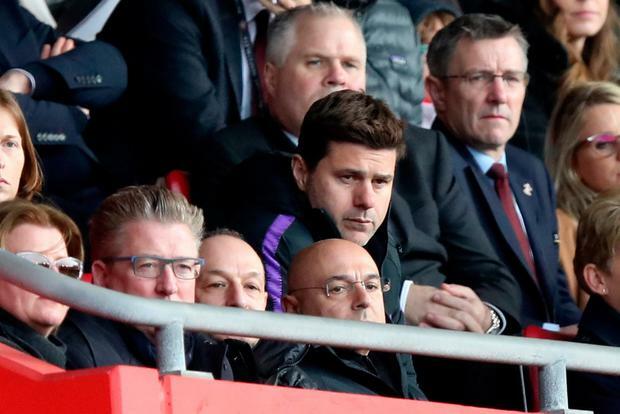 Tottenham Hotspur's Chairman Daniel Levy (bottom row, centre) and Tottenham Hotspur manager Mauricio Pochettino in the stands during the Premier League match at St Mary's Stadium, Southampton. Andrew Matthews/PA Wire. With Pochettino banished to the stands it was down to his assistant Jesus Perez, first-team coach Miguel D'Agostino and goalkeeping coach Toni Jimenez to lead the team from the sidelines. The trio remained in contact, with the manager appearing to text Perez from time to time as he sat a row behind his chairman, Daniel Levy. Yet during the first half Pochettino could happily have kept his phone in his pocket given how comfortable Tottenham were. The visitors dominated possession and territory and would have scored earlier were it not for sloppiness in possession. Kane had two early speculative efforts before almost forcing Maya Yoshida into scoring an own goal on 21 minutes. The defender slid across his area in an attempt to keep out the forward's cross and, in doing so, diverted the ball on to his own post. Fortunately for Southampton, the ball bounced out. The moment summed up the game - Tottenham doing the attacking and Southampton looking shaky and unsure in their attempts to keep their opponents at bay. It was, therefore, a rather cruel twist of fate that Southampton conceded after attempting to at last exert some pressure. The hosts pushed up and got outside Tottenham's area, but the move broke down and, after a slick counter-attack involving an exchange of passes between Alli and Kane, the latter slid the ball past Angus Gunn from an acute angle. Replays suggested Kane's knee was offside but it was marginal and, in truth, Southampton could hardly complain given how comprehensively they were being outplayed. The hosts ended the first half with only 34pc possession and having not had a shot on target. Hasenhüttl made a double substitution at half-time, bringing on Shane Long and Josh Sims for Oriol Romeu and Charlie Austin and the pair combined almost immediately to cause mild panic within Tottenham's defensive ranks. This game suddenly felt different as the hosts played with more aggression and ambition. On 56 minutes Nathan Redmond hit the side-netting following a poor attempt by Davinson Sanchez to clear Long's cross and the same player found the other side-netting nine minutes later following Valery's delivery. Tottenham were being pressurised and, as such, it was not a great surprise to see Pochettino suddenly making greater use of his phone. Ultimately, he was powerless to stop his team being pegged back and it will have pained the manager that it came about in such slapdash fashion. Having come on as a 73rd-minute substitute for Long after he had collected an injury, Stuart Armstrong sent a left-side cross into the area. The ball went past Sanchez, Jan Vertonghen and, finally, through Danny Rose's legs after the full-back made the error of thinking nobody was behind him. But someone was - Valery, who scored his second goal in two games with a scuffed finish from close range. Tottenham were now well and truly rattled and their misery was complete when Ward-Prowse curled a free-kick into the net from just outside the area for the winner.